For additional help, see our property tax FAQ. Step 1: Select the appropriate button for your search; either by Property ID, Owner Name, Property Address or Billing Address. See Illustration 1. Once you select an option, instructions will appear with examples of how to enter the applicable criteria. a) If you selected Property ID in Step 1, enter the property ID in the field provided using only numbers and click the "Search" button. If you have any questions about how to enter the property ID or what results will be retrieved, instructions with examples of how to enter the property ID appear below the search field. See Illustration 2.
b) If you selected Owner Name in Step 1, enter the owner name in the field provided. If you are entering a last name and first initial or first name, you must put a comma between the last name and first name/initial. Then click the "Search" button. If you have any questions about how to enter the owner name or what results will be retrieved, instructions with examples of how to enter the owner name appear below the search field. See Illustration 3.
c) If you selected Property Address in Step 1, enter the property address in the fields provided. Read each field carefully so you are entering the correct information; drop down arrows are provided to ensure the correct abbreviation is used to assist in your search. Then click the "Search" button. If you have any questions about how to enter the property address or what results will be retrieved, instructions with examples of how to enter the property address appear below the search field. See Illustration 4.
d) If you selected Billing Address in Step 1, enter the billing address in the field provided (this is the address where you receive your mail) without the city and state. Then click the "Search" button. If you have any questions about how to enter the billing address or what results will be retrieved, instructions with examples of how to enter the billing address appear below the search field. See Illustration 5. Note: You can narrow your search results by selecting a specific Tax Year and/or Status (i.e. paid or unpaid) from the appropriate drop down boxes in the search fields. Step 3: From the Property Search Results page, find the property in the list that you wish to pay. Click the button located in the far left column in the row for that property. See Illustration 6. 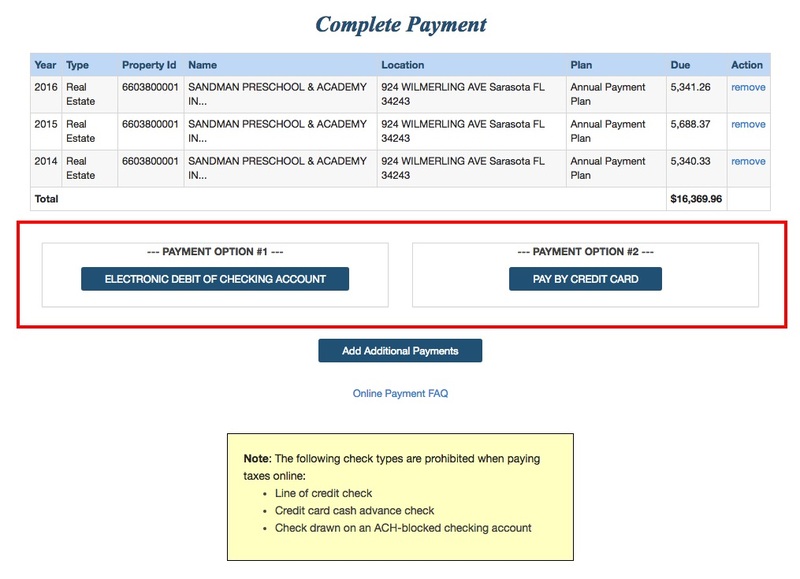 Step 4: In order to select multiple properties for payment, a checkbox to the right of each account is available to select. This checkbox is used to add one or more properties to the cart and to obtain a copy of each account's tax bill. See Illustration 7. Note: Both the "View Tax Bills" and "Pay Taxes" button are disabled until you begin selecting properties by clicking the checkboxes. Additionally, if you select an account that is already paid, the "Pay Taxes" button will be disabled. The button is enabled only if all selected properties are eligible for payment. See Illustratiion 7. If you are making a payment on an installment account, clicking the button will first bring up the list of quarterly scheduled payments. Select the appropriate quarter(s) by marking the checkboxes for each quarterly scheduled payment that are due and then click the "Pay Now" button. See Illustration 8 below. Invalid Payment for Account Number: <123456789>. All unpaid quarters must be selected and paid. October No payments allowed unless tax roll is opened in October for early collection (prior to Nov. 1st). If tax roll is opened for collection in October, then the details under "November" below apply in October only from the time that the roll is opened for collection. After selecting a property or multiple properties for payment by selecting the 'Pay Taxes' button, a page will load that allows you to choose your online payment type. You must select Payment Option #1 (Electronic Debit of Checking Account) or Payment Option #2 (Pay by Credit Card). See Illustration 9. Note: For each payment type there is a processing fee charged by a secure 3rd party payment processor which is necessary to cover the additional fee imposed by financial institutions/credit card companies for debit/credit card purchases. For more information on the processing fee, access our online payment FAQ. You will be able to view the grand total before you checkout. 1. Payment Option #1 (Pay by Electronic Debit of Checking Account): Once you select 'Electronic Debit of Checking Account', you must select 'Continue' which indicates that you understand a convenience fee will be assessed and you wish to proceed. See See Illustration 10. Once you select 'Continue', you will be directed to the CHECKOUT page which displays the convenience fee in red prior to entering your payment information. If you wish to receive future bills by e-mail, mark the box next to "Get future bills by email!" before selecting 'Complete Transaction'. See Illustration 12. 2. Payment Option #2 (Pay by Debit or Credit Card): Once you select 'Pay by Credit Card', you must select 'Continue' which indicates that you understand a convenience fee will be assessed and you wish to proceed. See See Illustration 11. Once you select 'Continue', you will be directed to the CHECKOUT page which displays the convenience fee in red prior to entering your payment information. If you wish to receive future bills by e-mail, mark the box next to "Get future bills by email!" before selecting 'Complete Transaction'. See Illustration 12. Illustration 10 (Payment Option #1). Illustration 11. (Payment Option #2). 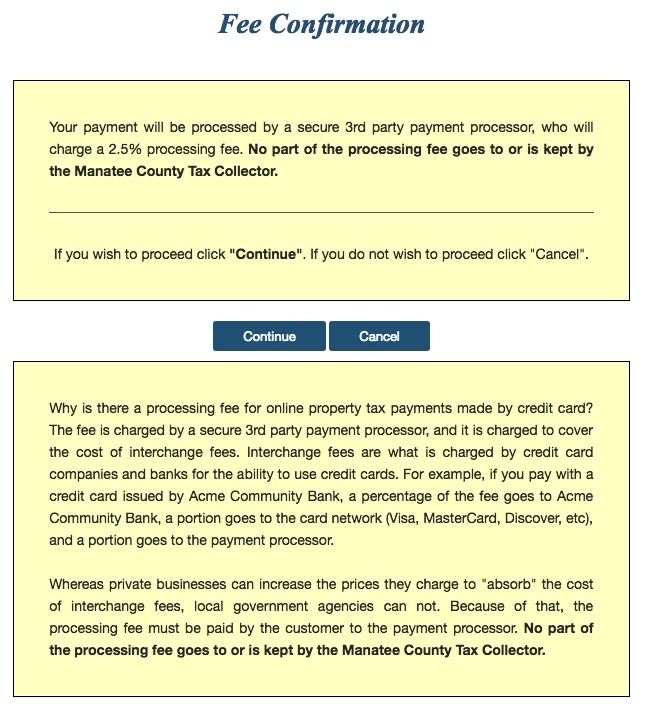 Once you select 'Complete Transaction', a new browser window will open directing you to Bill2Pay, the Manatee County Tax Collector's Property Tax Payment site, where you will be able to continue making your online payment. See Illustration 13 below. Once you select 'Continue', you will be taken through the payment process and once you complete your payment, a confirmation page will be displayed. This page can be printed for your records and you will receive a confirmation email as well at the email address you provided during the payment process. NOTE: In order to avoid duplicate payments, please do not click twice when submitting your payment and do not click the back button. Your payment will post the next day. 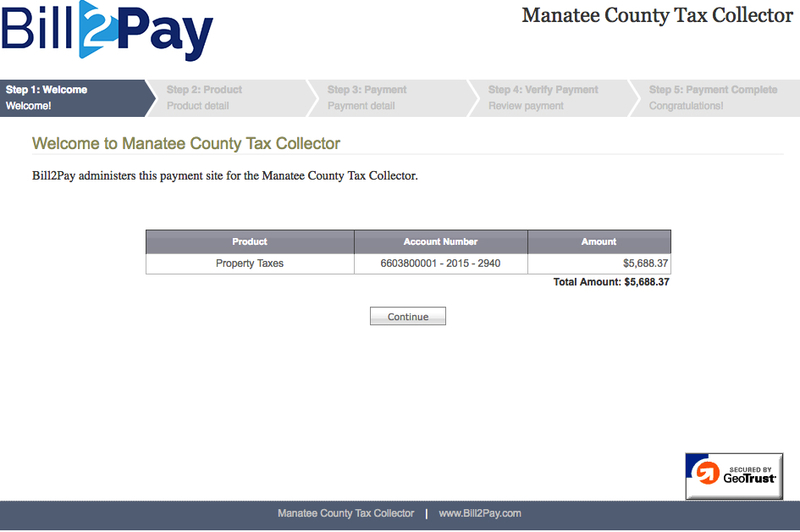 Provided all account information was entered correctly and your payment clears, you will have the option to print a duplicate receipt within three (3) business days on taxcollector.com from the Tax History Results or the Detail page. You also have the option of printing a duplicate bill. To print a paid receipt, you must first locate the account(s) by following the instructions in Step 1 and Step 2 at the top of this document, and then select the yellow 'Print Receipt' button. The button will only retrieve the duplicate tax bill for that particular tax year, not a paid receipt. See Illustration 14 below. Please be sure to read all disclaimers. The accuracy of the information provided on this website is not guaranteed for legal purposes, and we are not responsible for payment transactions that could not be processed as the result of technical difficulties such as downtime due to system maintenance or any other occurrence.